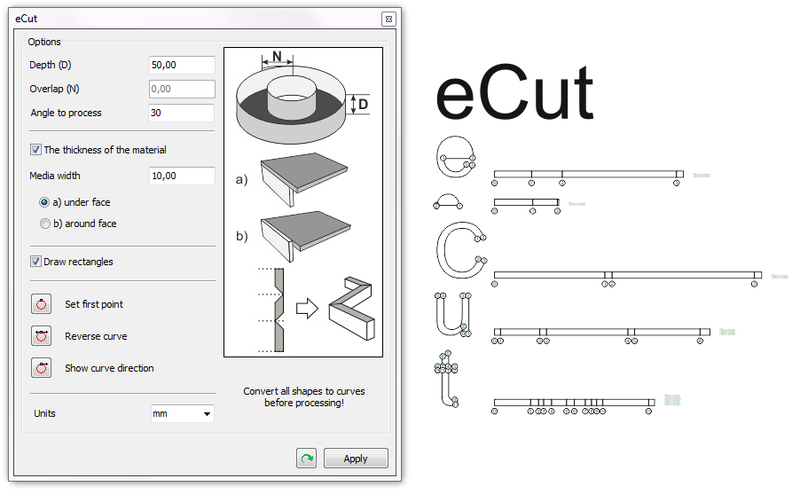 To update eCut - download latest version and install. 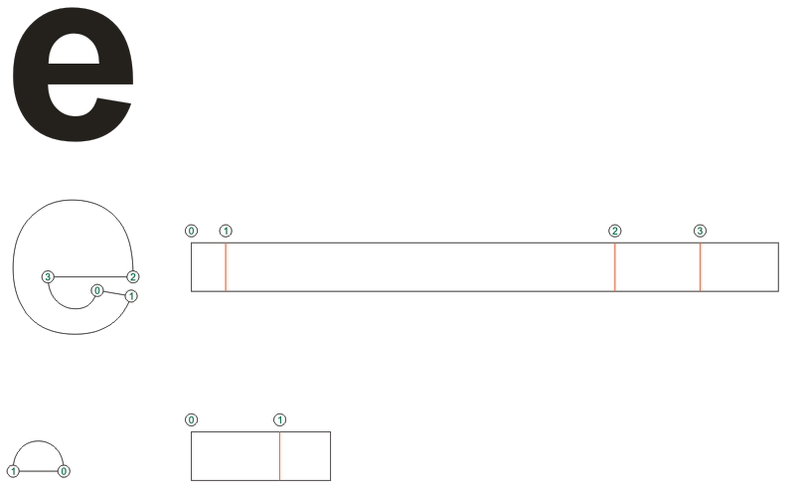 How to create edge roll with notches. New cropmarks for Versa and Simple1 for summa. Nesting function can now rotate everything on 180deg. Route optimizer can change first point of each path near to its corner. New feature inside slice function - manual mode. 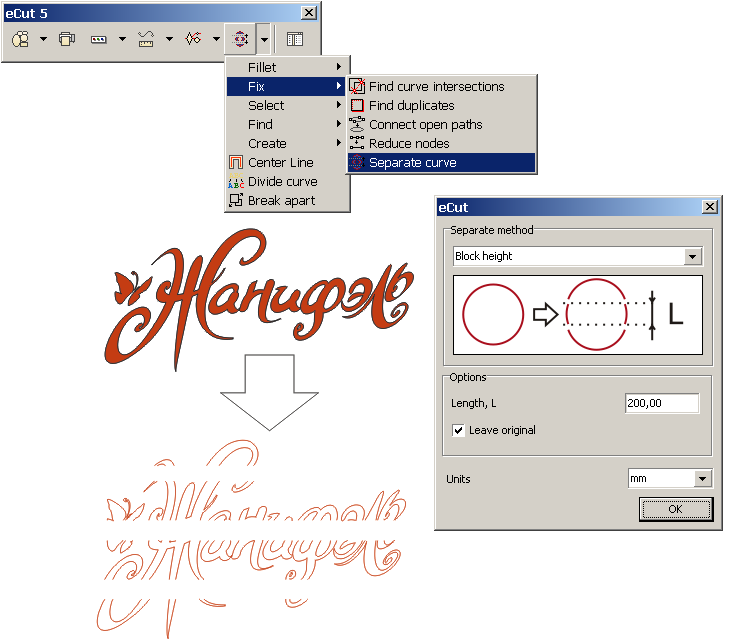 Use it to create stencils or cut difficult shapes. 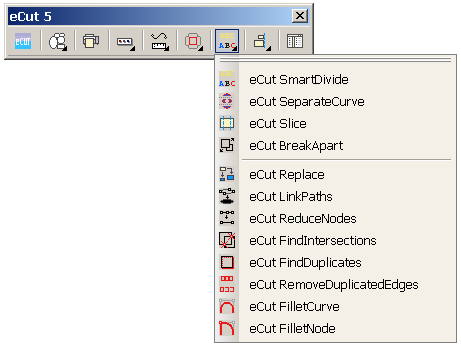 Hotwire cutter can cut shapes not node-to-node, now you can set any position on shape. Added forms scaling for high resolution monitors (4K and more...). In finger-joint box there are dividers now. 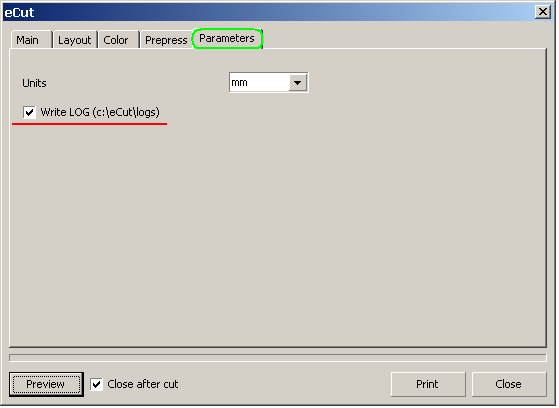 Cut/plot: - if your plotter can not pause while rolling down material - you can try to fix it by setting RollDownStep. 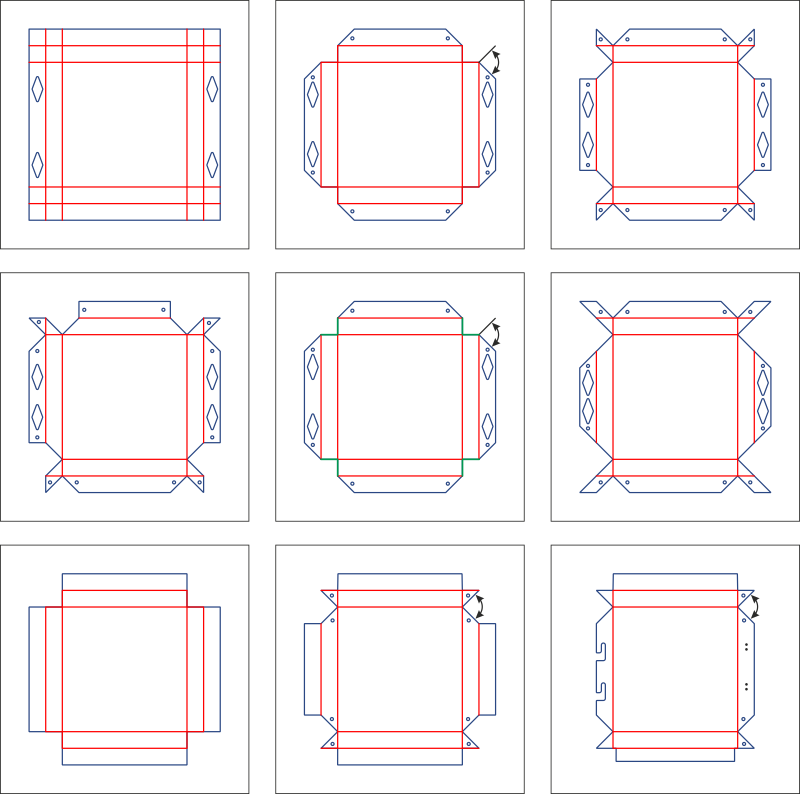 Search duplicates: now you can process each path of combined shape. New version of signbox creator with new method. Added CorelDRAW 2017 support And some fixes to same version. Bridge creator can swap strokes now. 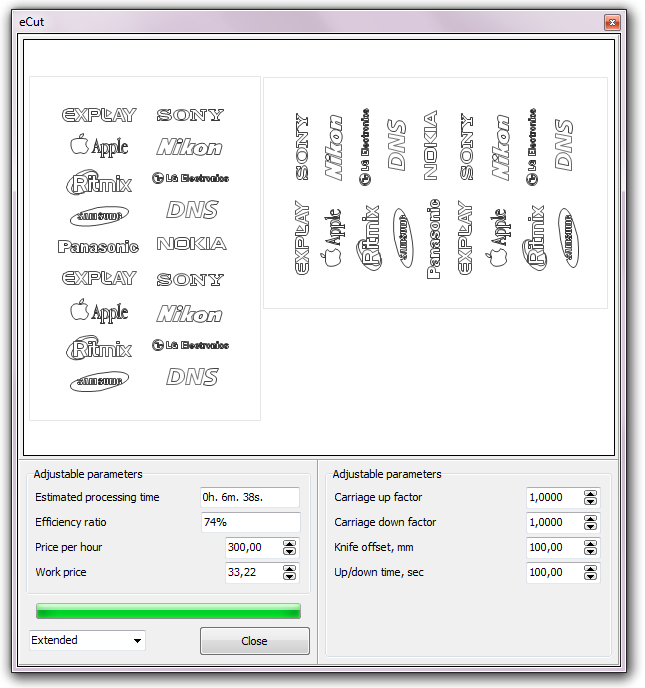 And some more features: barcode generator can make thicker lines, 64bit support improved, cut function updated. Cost calculator, Rectangle nesting, True shape nesting, Multiply, Create carrier. Many little fixes and improvement that was made for last months. 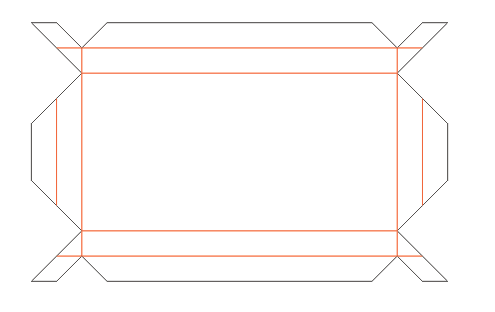 Weeding lines can create separate lines to separate text lines. LEDs show how many diodes was created in status bar. 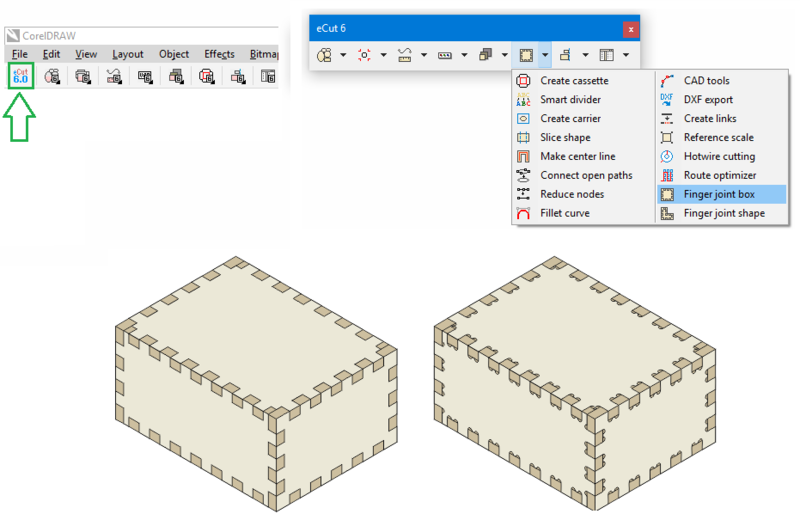 New function - finger joint box creator. 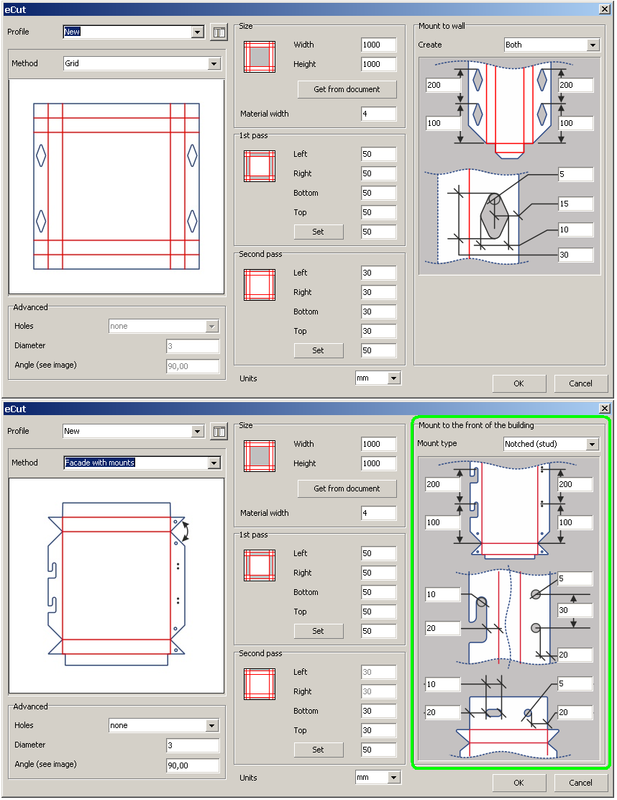 You can use laser or CNC milling machine to create this boxes, function can compensate CNC tool diameter. 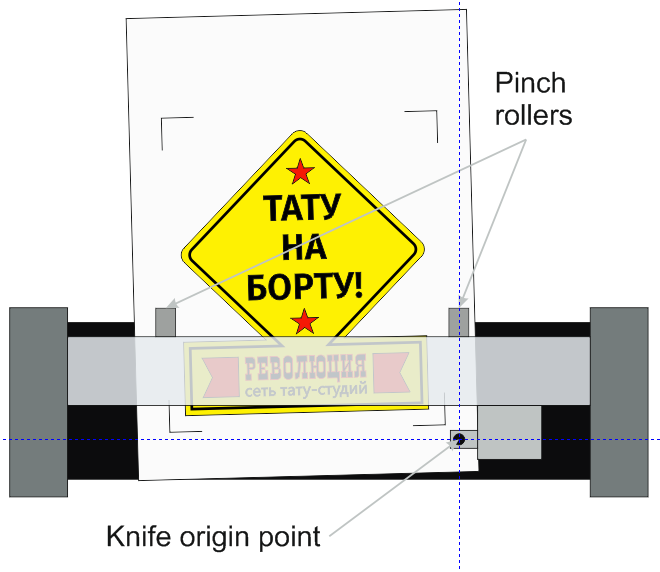 Also fixed bugs that could cause 64bit CorelDRAW error when processing very complex shapes. Also search function was improved. 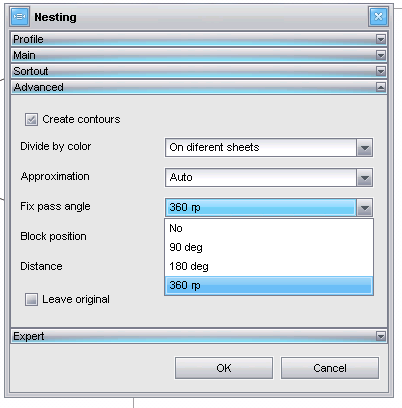 Nesting can create blocks in rows after nesting if they are not fitting to area. Weeding lines can make lines smaller. 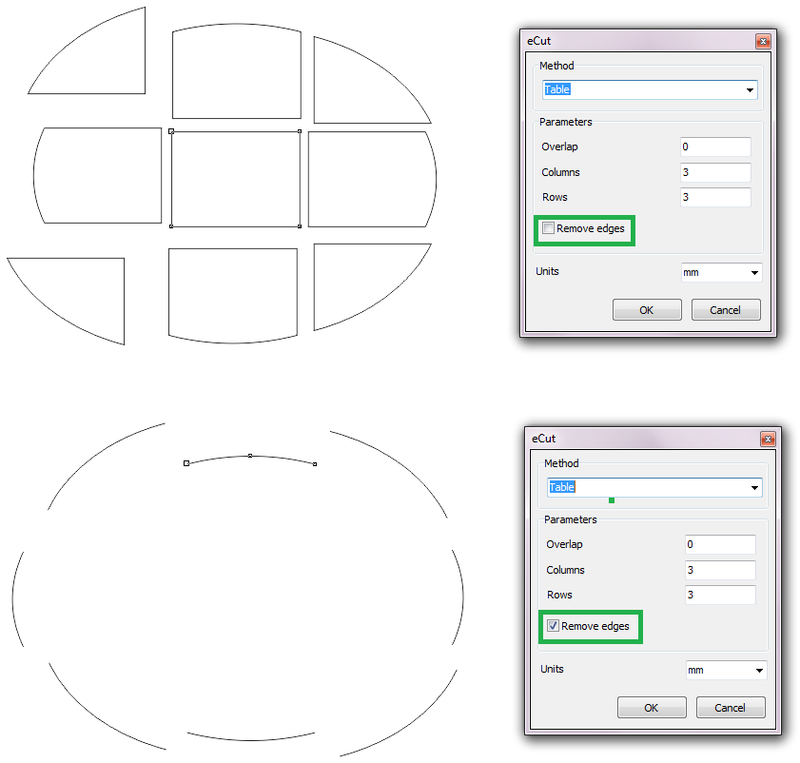 New cropmarks - circles with variable diameter. Added new feature in route optimizer - "change first node". 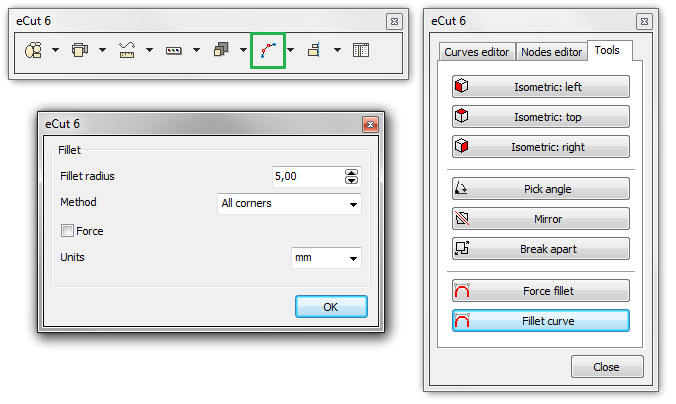 Allows eCut to find best point to start curve and decrease tool UP time. 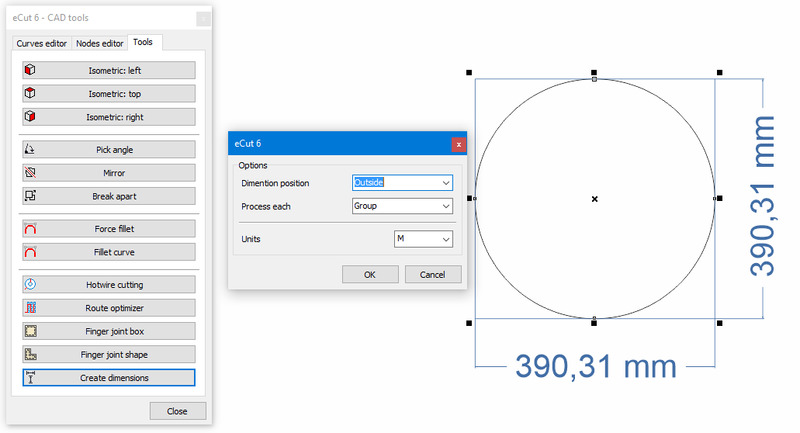 Multiply has "Fix angle" feature to block rotation of original shape. In Variables new delimiter was added to import filter - ','. New feature - route optimization. New feature in TIME function. Nodes redraw updated in hotwire cutting feature. 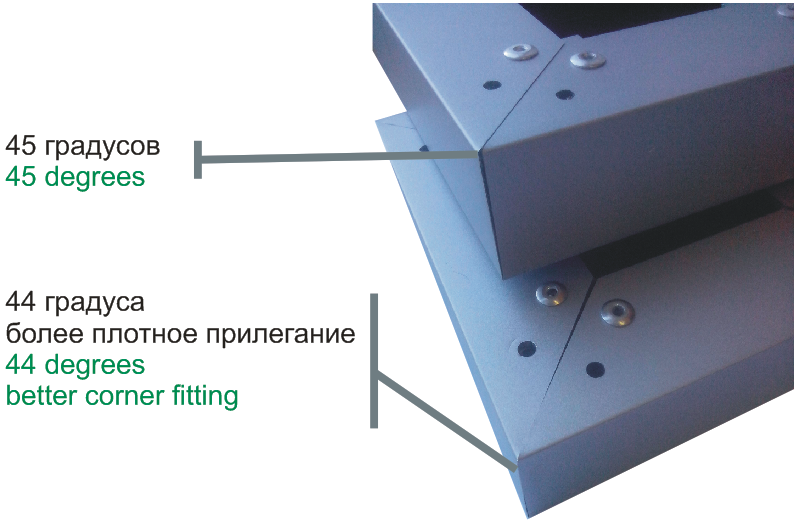 New function is used to construct a single path for cutting foam (and similar materials) on specialized machines with hot wire. 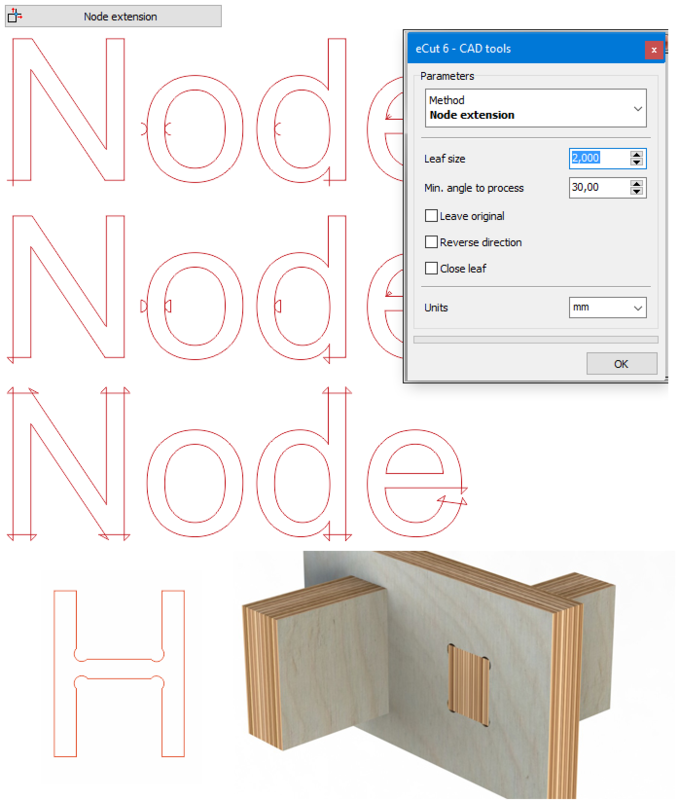 Also, very useful will be new feature from CAD-functions : Node extension. Also Remove dup. edges was updated - now it more faster and stable. Edge roll function was updated. LEDs function was updated. 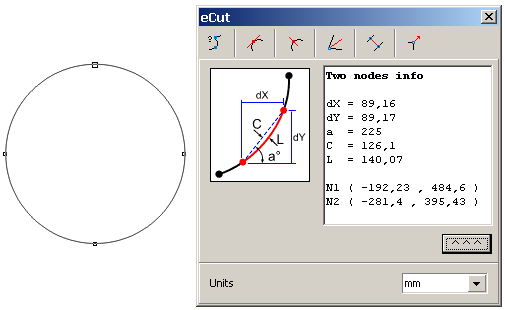 Now eCut will place more diodes on curve. 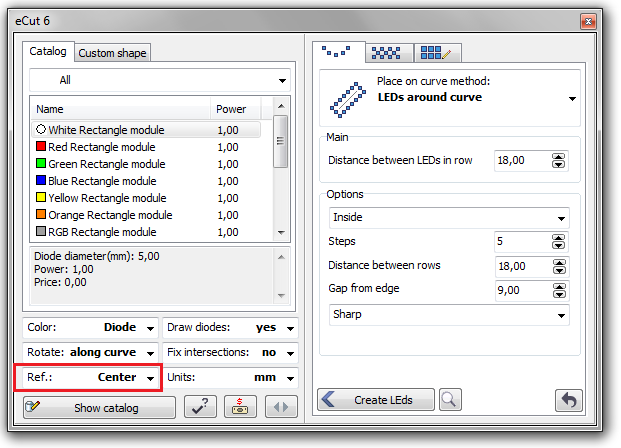 Now you can select reference point when placing diodes on curve (or fill). It can be center or edge of diode. Also Italian UI language was added. 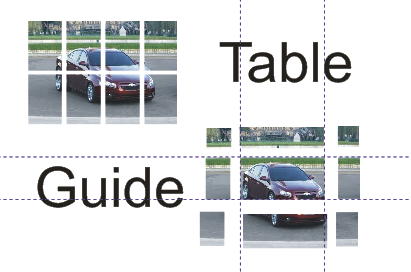 Allows you to set empty space between nested objects and sheet boundbox. 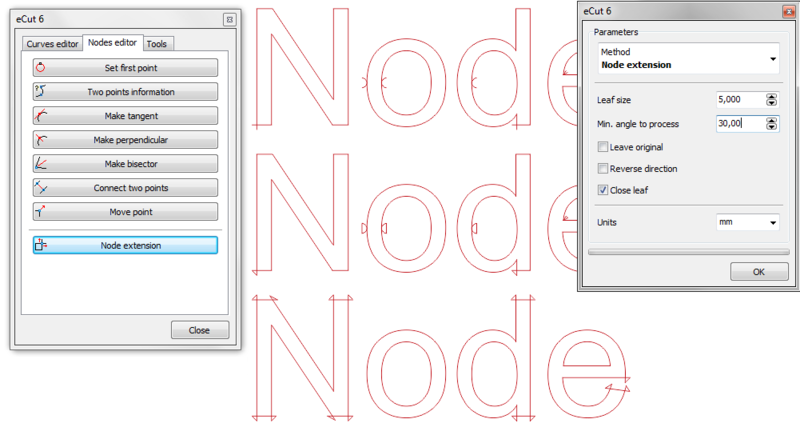 Also "Page margins" was renamed to "Reduce sheet size"
DXF export now works better with autocad. 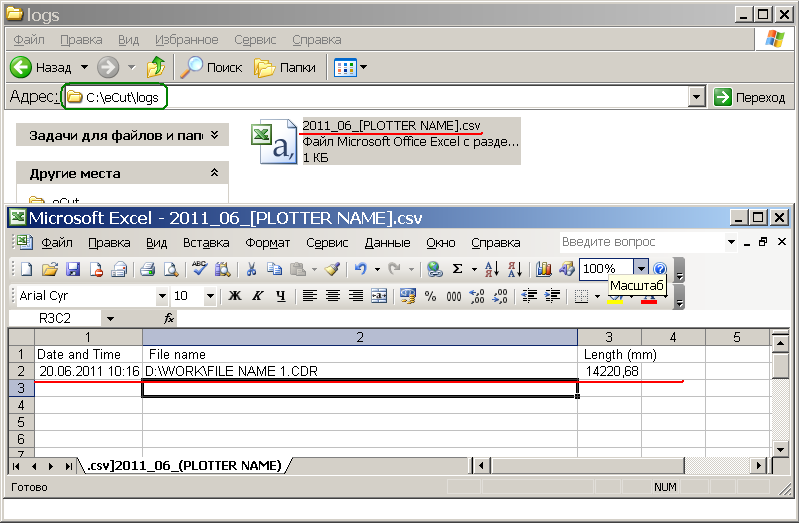 Now, if document scaled, you'll see message about it. 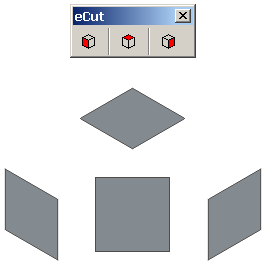 Because eCut works only with real coordinates. The most useful- nesting. Added (as before) the height of the resulting output block. And the unused area will be crossed out. And now you can select best result from list. 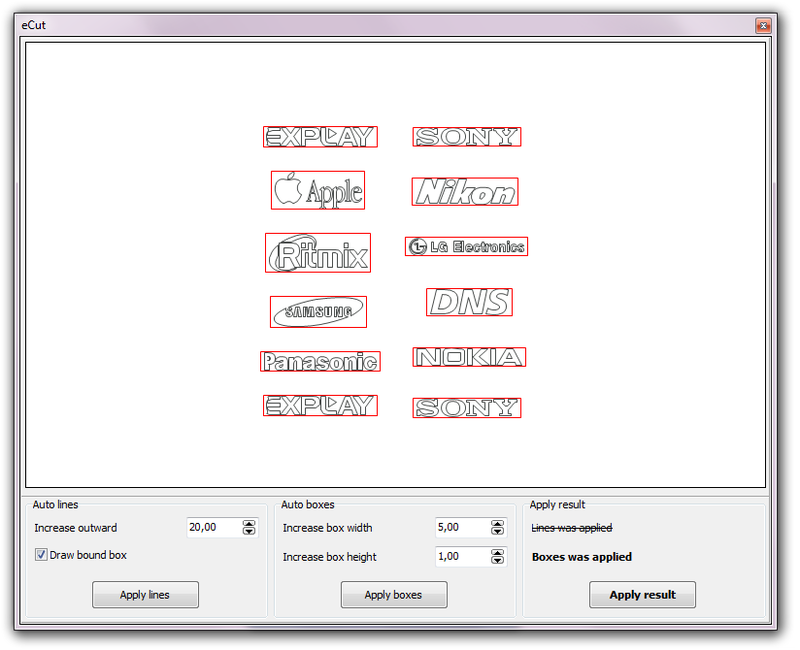 You can make several attempts and select best using arrows on form, nesting will save them all. Also, later, was added button that allows you to select best nesting result according to blocks height. Several fixes and features innovations in pricing. Added a button that allows you to collect data in a single window with multiple files. Function variables can now generate a specified number of rows, allowing you to add the line automatically if they are not enough. 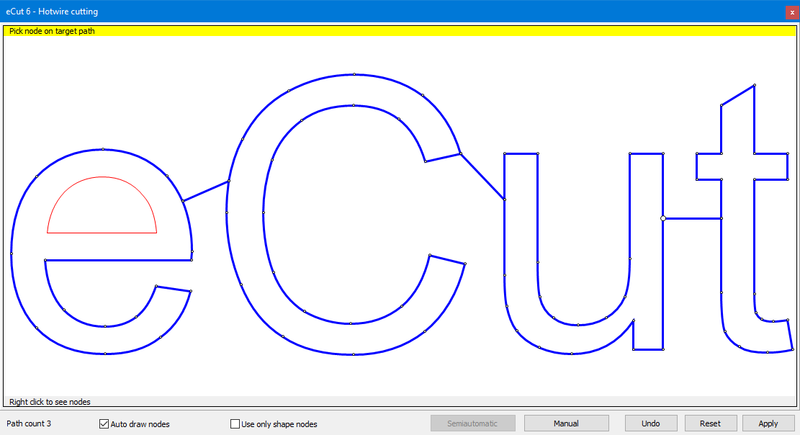 New cropmarks added - for eCOM contour cutting feature. Some little updates in Plot and Cost functions. In cost feature you can add new lines to active form. New version of plugin is released! 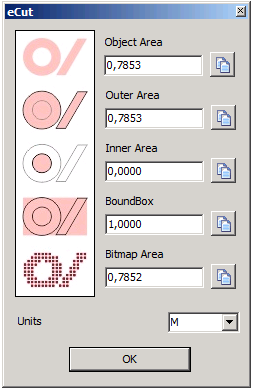 This feature allows you to find out how much time you need to process selected objects on plotter/cutter (or even CNC) . 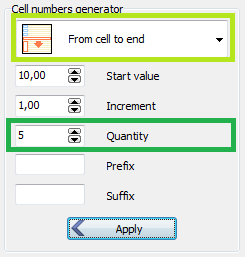 This function has two window types: compact, here you can see only result time and can calculate cost. And extended type: here you can specify coefficients to get better result and also you can see preview. 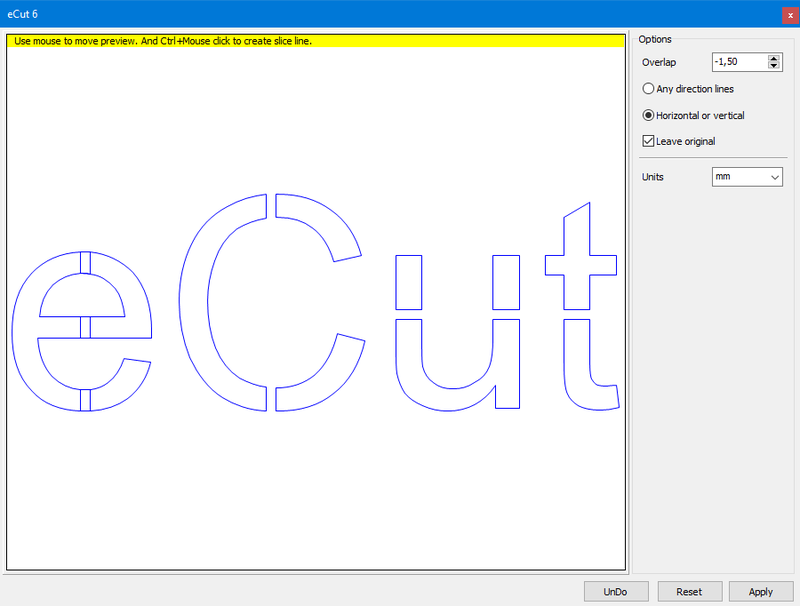 On preview image you can see where cutter will work slower or faster: dark shapes slower, lighter - faster. Time calculator can show good result for Roland cutters (SPEED = 40sm/s NORMAL), but using coefficients you can get good result for most cutters. 22.07.2014 - Weeding lines feature updated. now it is faster and has new method. Curve linker can close opened paths automatically. 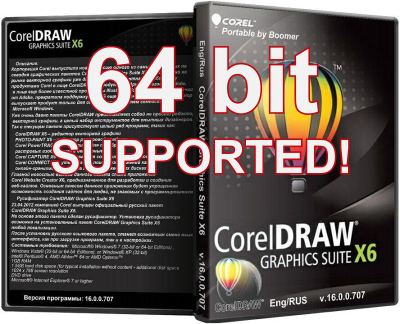 01.04.2014 - CorelDRAW X7 supported! Curve linker feature updated. 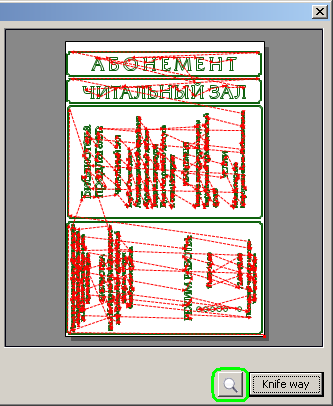 In past in CorelDRAW X6 there was bugs - now everything is OK. 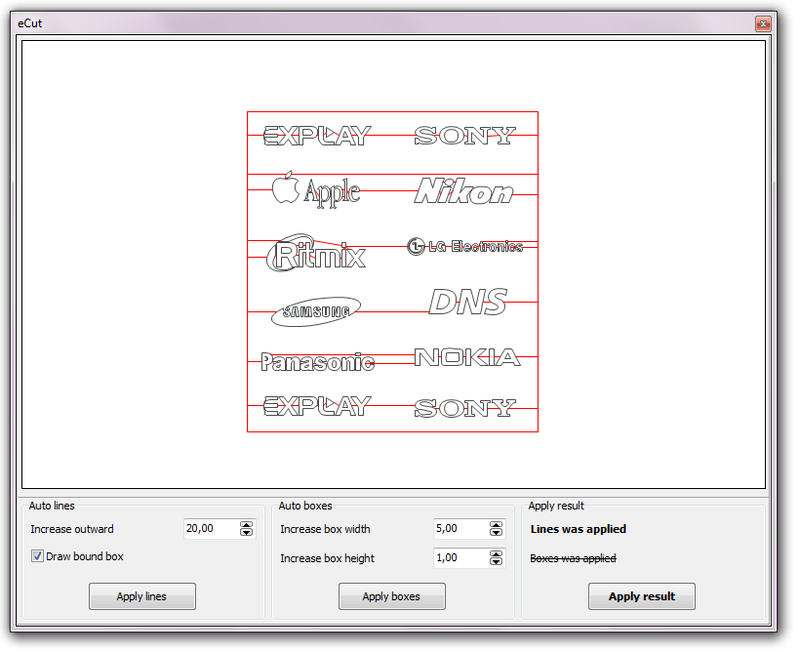 It is compatible with any plotter (99%) with or without laser pointer. Here is tutor about how it works: link. Later (may be) I'll make video tutor about it. Now eCut can ask for a test period by himself - without need to go on my site. Also new feature for laser owners - show "holes". Carrier function updated - now you can fix intersections. 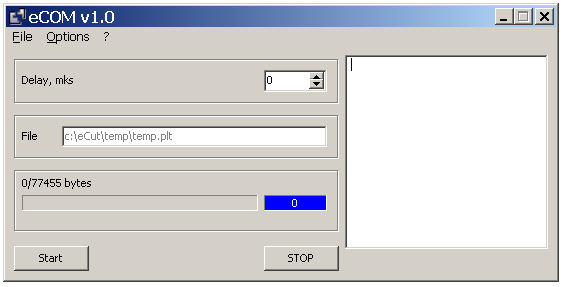 Also cropmarks creator can add filename into cropmarks area. 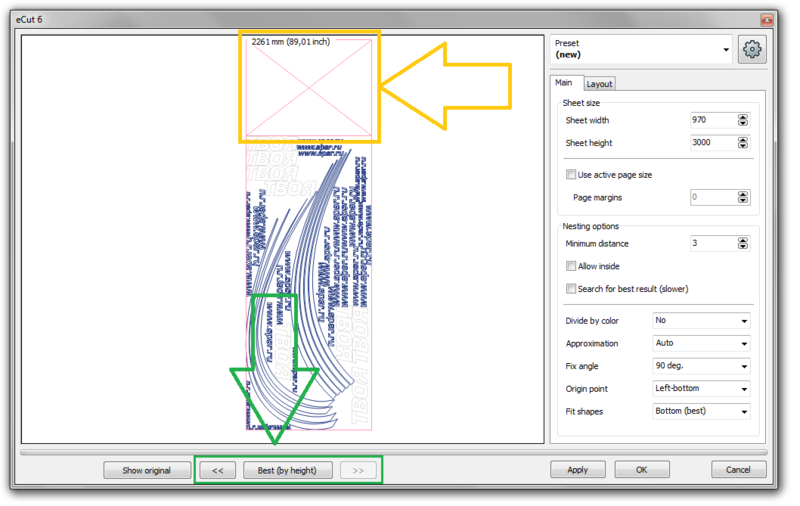 Now Cut/Plot function allows you to select sheet size from COrelDRAW list. 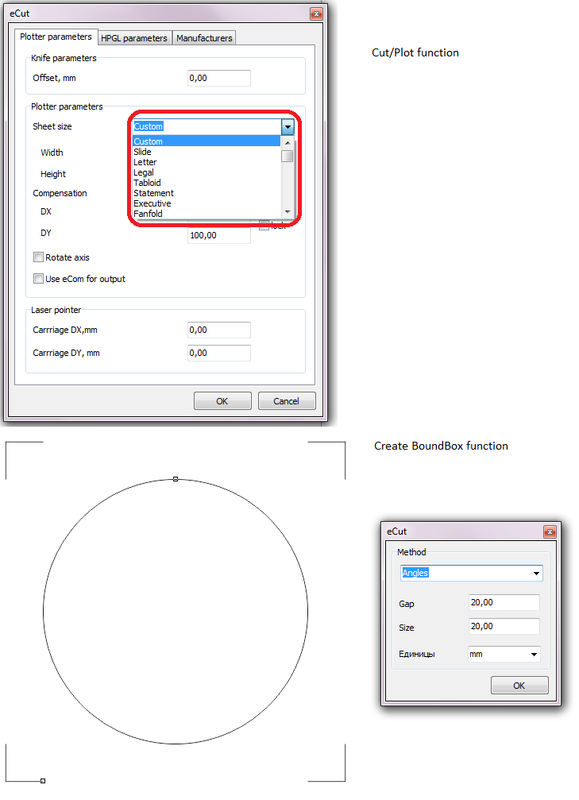 Also "Create boundbox" feature can set angle size. 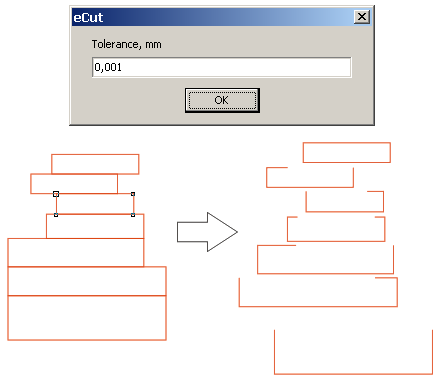 And "Slice" function can delete edges after cutting. And new effect - puzzle creator! Edge roll feature updated! 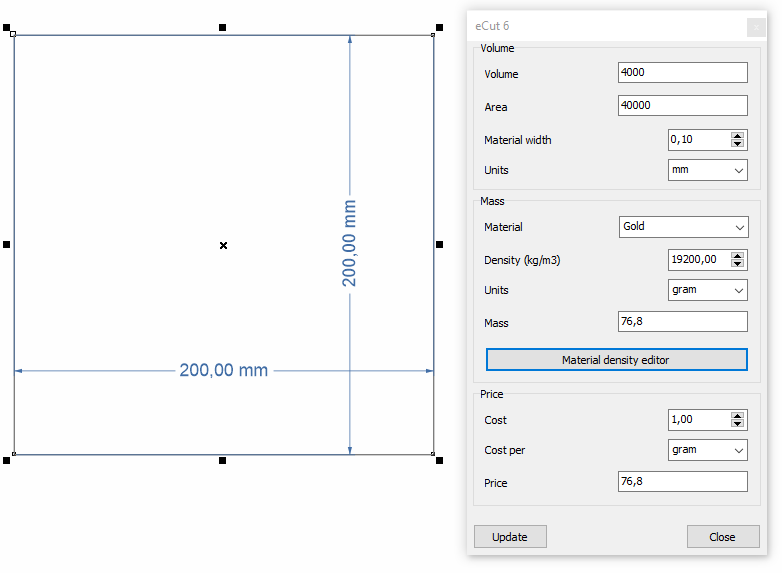 Now you can specify material width. Now testing time, and you can launch old and new function - as you wish. 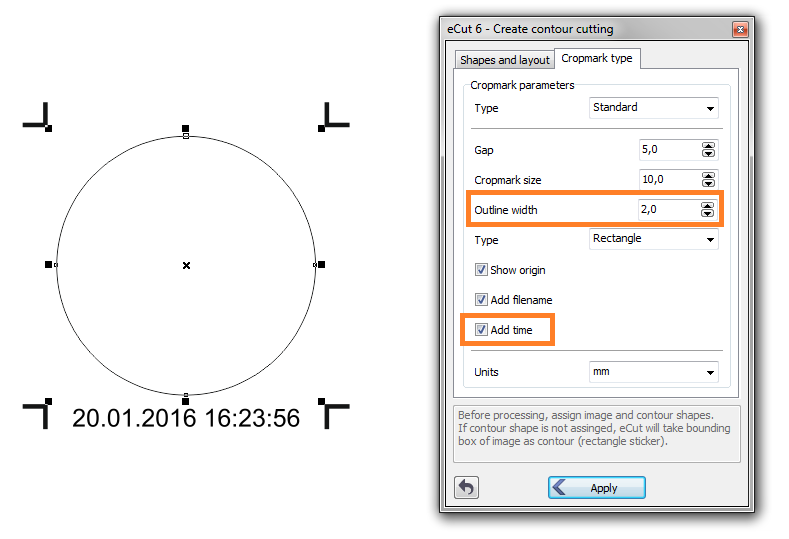 Print/Cut and CropMarks function updated. 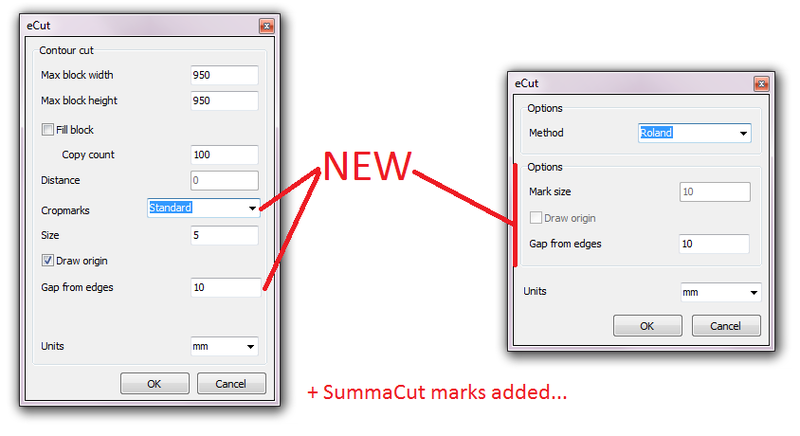 SummaCut marks added (Mimaki and Summa marks are very similar). Some little advantages. And new Area function interface. 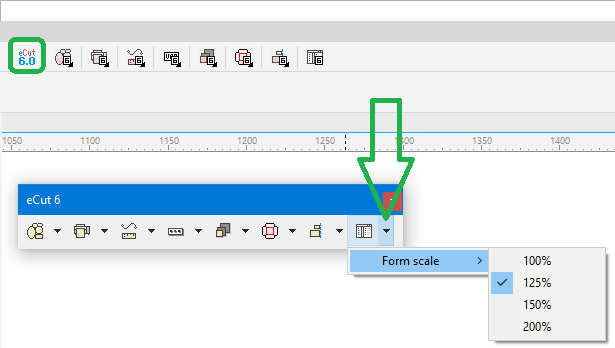 Some little changes in nesting function - now BIG objects will be placed fine at the edge of document. 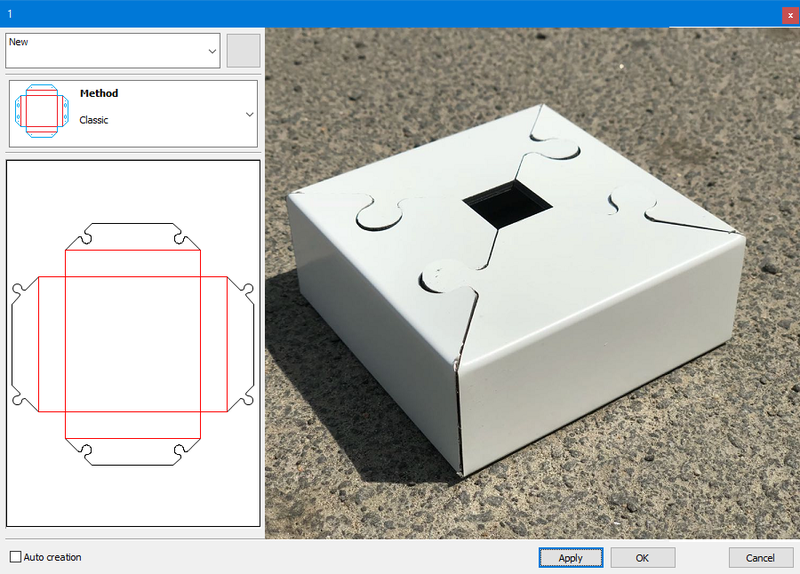 Find Intersection feature now can process segments inside one subpath. 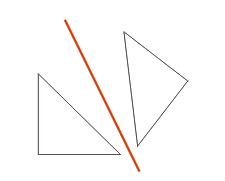 But neighboring segments are not processed, because they always intersects in common point. 2. Two new methods for building facade. 3. Also you can launch previous version of this function (eCutR5 124 ). 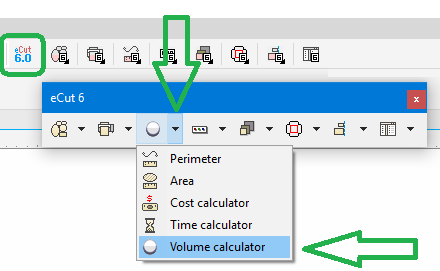 Also cost function now can calculate sheet as area. Great news!!! 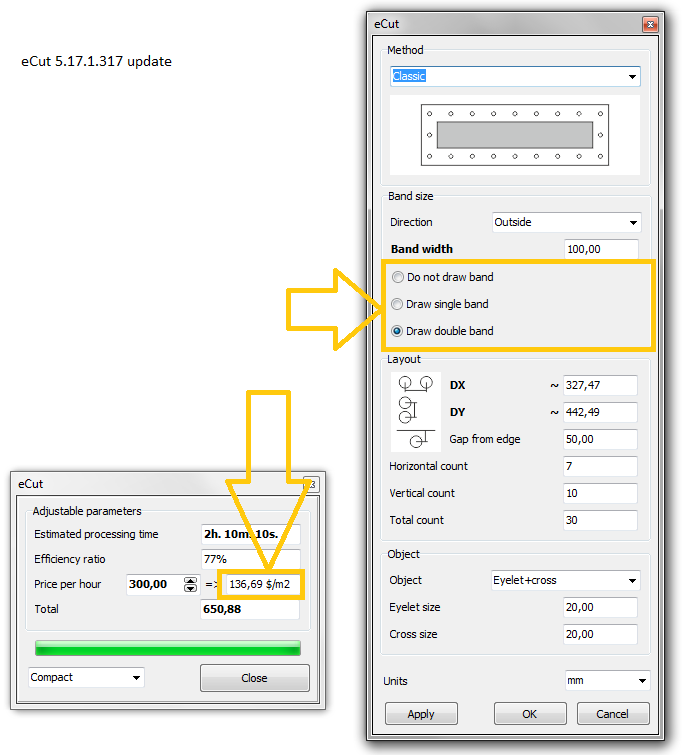 eCut for CorelDRAW X6 64bit is available now!!! Also some little fixes was made in Plot, Nesting and Cassette-creator functions. 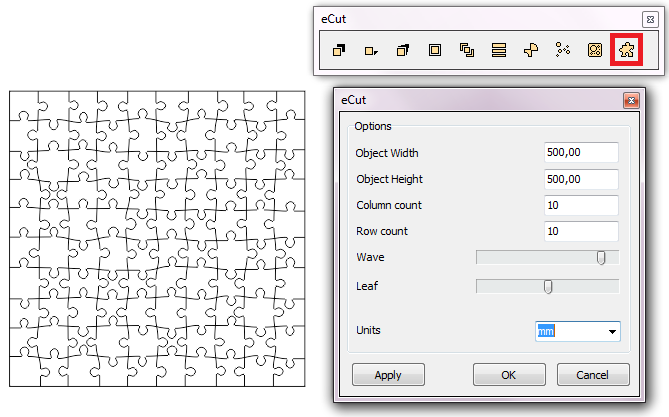 And also I've made new eCut panel for CorelDRAW - all functions are available in it. 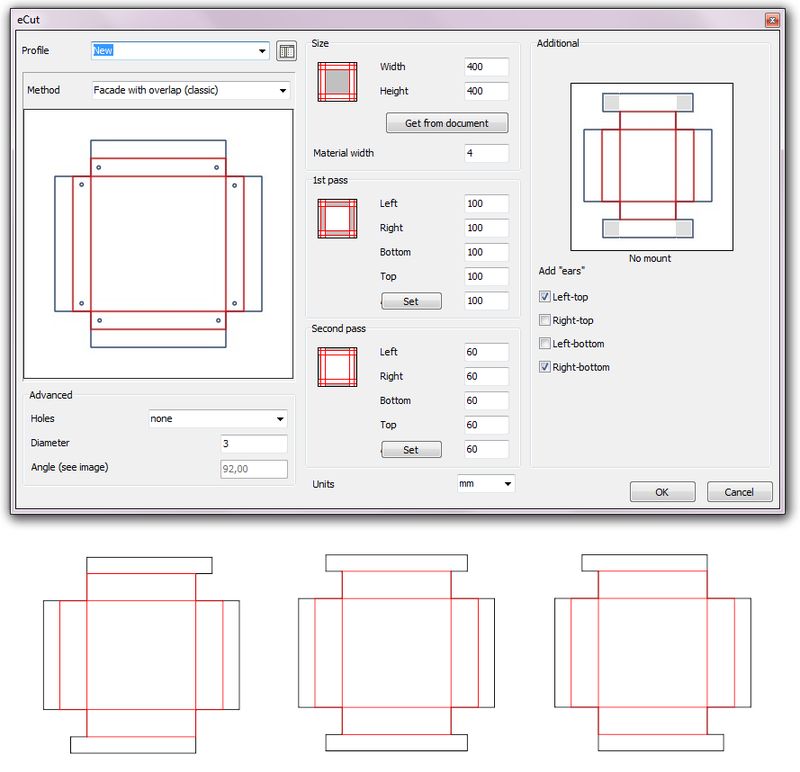 Another new method for composite box creator. 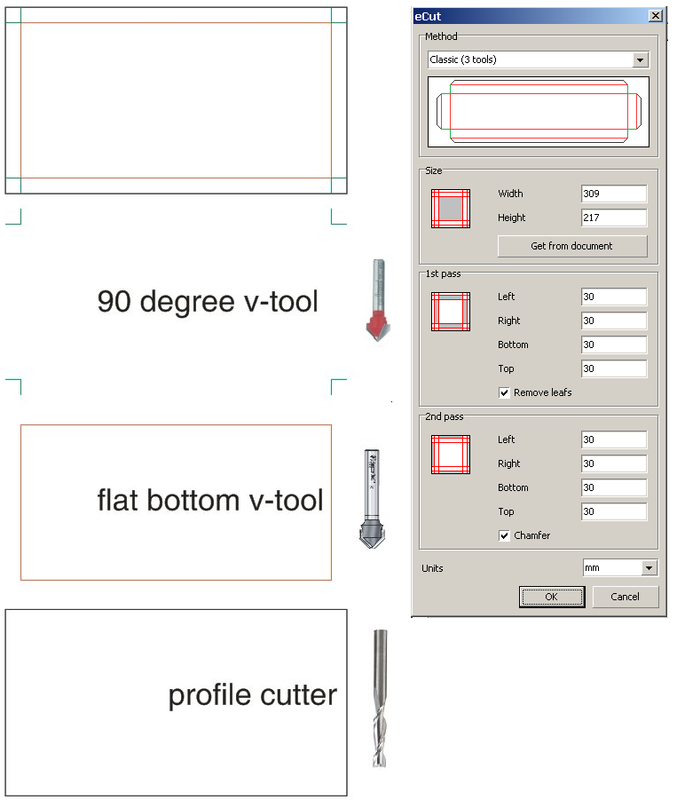 Now it can make composite box for 3 tools: 90 degree V-tool, flat bottom V-tool and profile cutter. New button allows you to see big preview! New little and useful function! 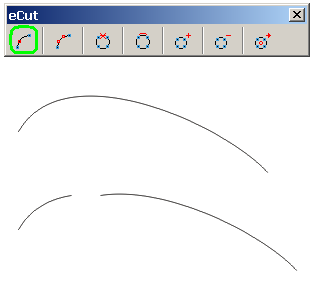 This function allow user to separate curves for cutting. Also weeding lines function updated! 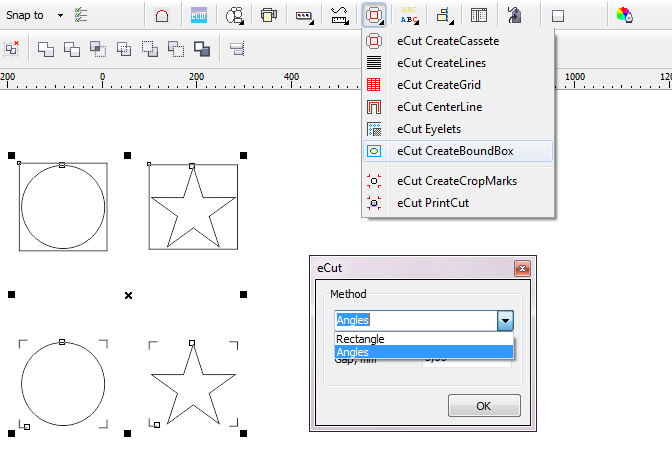 This PrintCut function allows user to create files for printing and cutting on Roland GX cutters. Now you can make plot function to collect statistics! Useful when making big letters. Added new method to create cassete. In new method hole will be created on the edge. Plot function can show UP way of knife! New feature in nesting function! 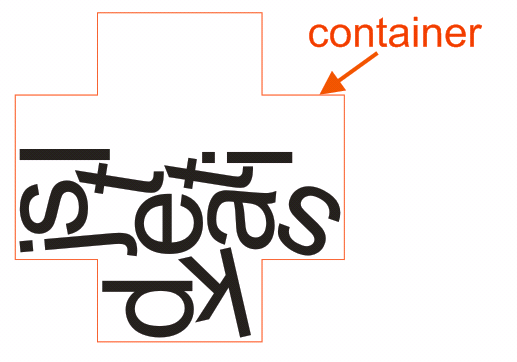 You can now specify the object, which will be the container for other shapes! 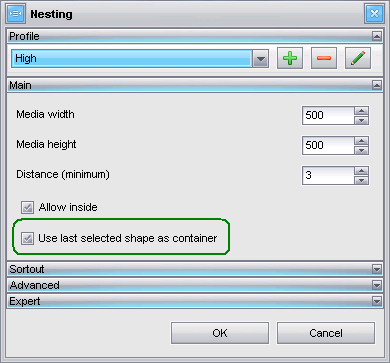 To do this - select all shapes you want to nest and after that select container (container-shape must be selected last) and all shapes that you selected will be placed inside the shape-container! 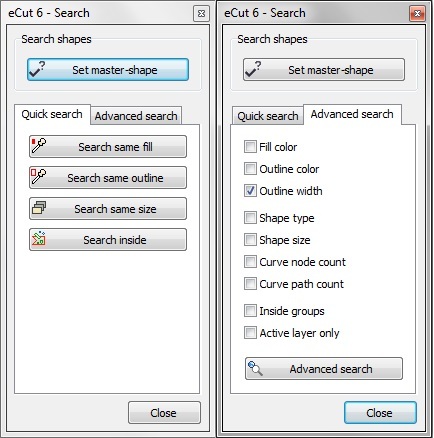 With this features eCut will analyze hole shape (Enrote method process only single subpaths) and apply opposite method to interior subpath from chosen outside process. 1. 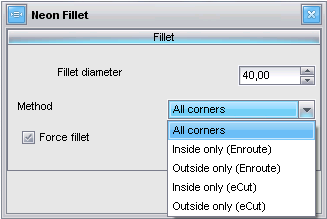 Fillet function can be called through macroses! This is for CorelDRAW X4 version! 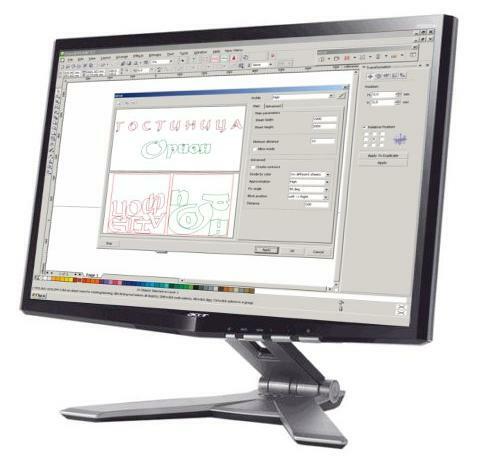 If You have another version of CorelDRAW - You have to change 'eCut14r2.dll'. 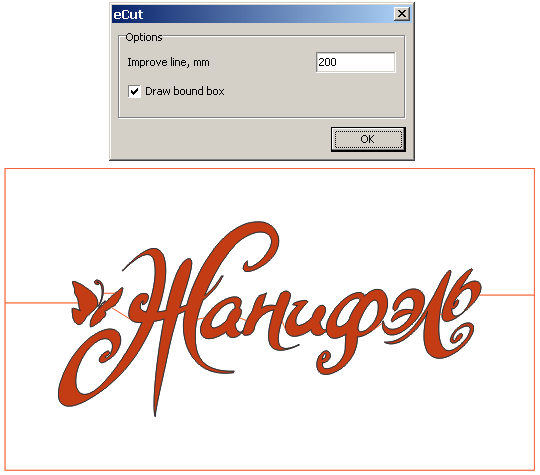 For example for CorelDRAW X3 - 'eCut13r2.dll' and etc. 1. Neon fillet has own dialog window. 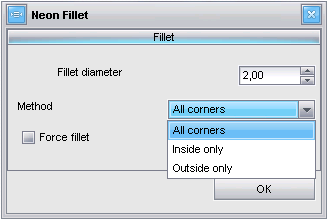 Uncheck 'force' if You have problems with fillet. 1. All changes was made in NEON function. 2. New Fillet algorithm - now it easy to fillet any bazier curve. 4. New features - auto-separate, auto-doubleback and etc. 5. Still in beta - can be errors. 1. Added 360 angle lock in nesting function. 1. Added ability to launch help file when pressing 'F1' button. 1. Nesting module do not changes color model of fill and outline. 1. Corel X4, X5 Neon bug - no doubleback creating. 2. Added 2nd algorithm of central line for X4,X5. 2. Fixed bug in nesting with color converting. 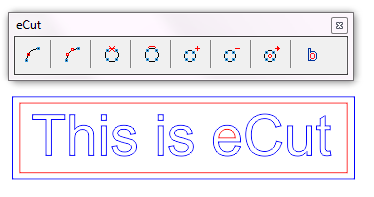 Now if You do not use 'divide by color' then eCut do not convert colors to RGB model. 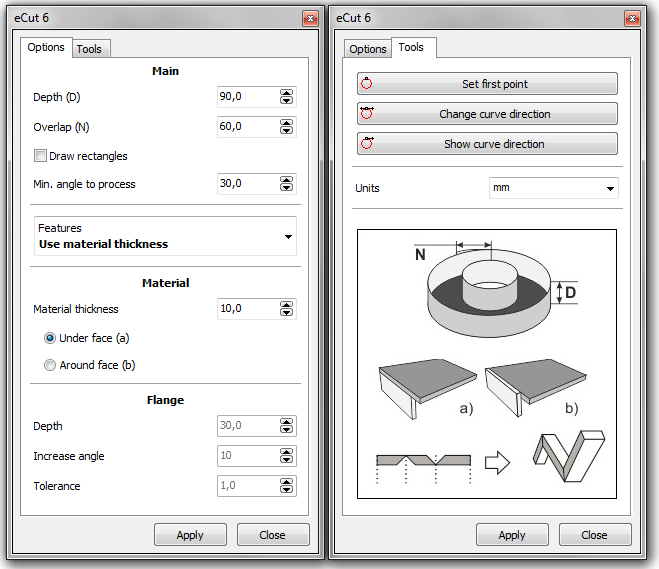 New version of eCut is available now! 1. New UI in all functions. 2. Very stable nesting and more faster. 3. Cut/Plot function can output by color. 4. 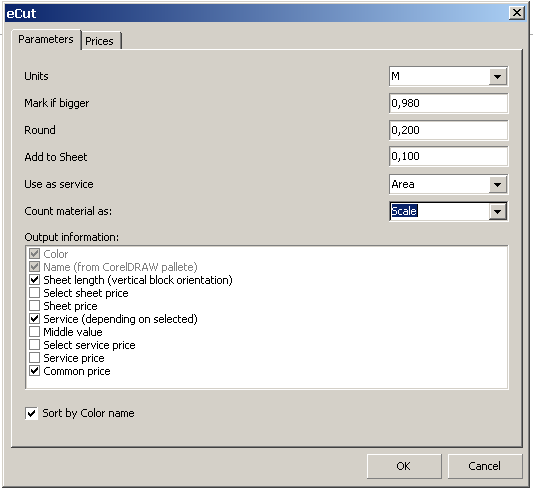 Cost function can sort blocks by color name. 6. Escape any window with 'ESC' button.